If America’s late 18th century “High and Mighty” were going to make a then remote seashore region (Monmouth Beach and Long Branch) a summer escape, it meant there had to be a dependable way to get there. And the railroad, as a conveyor of reliable travel, was just coming into its own in those years. Thankfully, New Jersey was ahead of everyone. 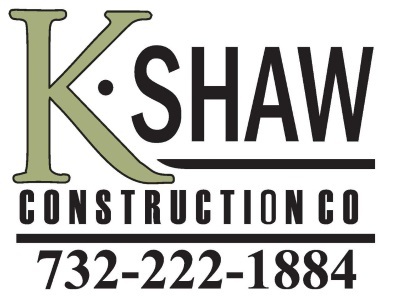 History records that the first commercial railroad charter in the United States was issued to the New Jersey Railroad Company in February 1815. According to a New York Times account, an active railroad cut through Monmouth Beach as early as July 1865. That first shore line, which connected with opulent steamboats that ported at Sandy Hook, ran along today’s Ocean Avenue and ultimately down to Toms River, mostly in the summer. Train Station at Monmouth Beach. The idea for a coastal rail line came from William A. Newell (he of the sterling resume: medical doctor, NJ and WA governor, NJ shore congressman, and White House physician), who pitched the idea to his friend, President Abraham Lincoln. 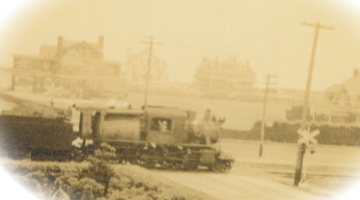 In March 1864, the Long Branch & Sea-Shore Railroad was incorporated. By 1868, a round trip from New York to Long Branch (the one-way steamship-train route took 1 hour, 45 minutes) cost $2; by 1889 a monthly pass was $24. A steamboat of choice back then was the Keyport-built River Queen, once a favorite of President Lincoln and General U.S. Grant for secret Civil War strategy meetings. Thanks to that new train (“affording a fine view of the ocean and the benefit of the sea breeze,” the New York Times reported) the Monmouth Beach spot became a choice summer resort for the rich and famous. Leading the railroad development efforts in town, and around the northeast, was town resident George Fisher Baker — then one of the richest men in the country. In 1879, the Long Branch & Sea-Shore Railroad became part of the N.J. Southern Railroad (Robber baron Jay Gould figured in this deal), which was then taken over by the Central Railroad of New Jersey in 1882. Baker, one of J.P. Morgan’s closest friends and associates, was the largest stockholder in the Central Railroad and its president. 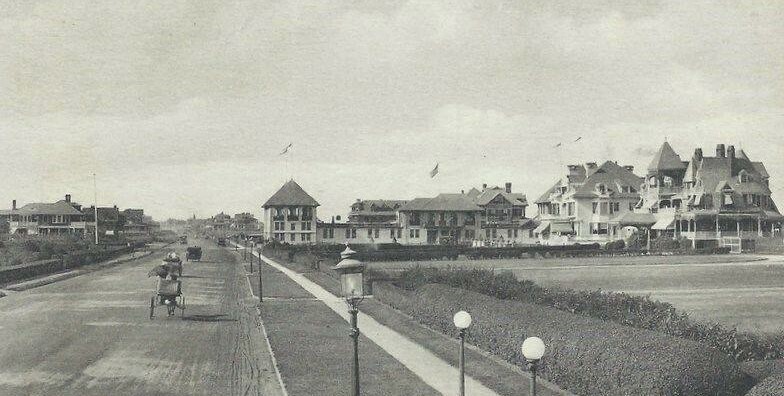 The glory years really began in 1871, when the newly minted Monmouth Beach Association sought to facilitate better oceanfront traffic and make Ocean Avenue “a grand boulevard” with magnificent “summer cottages.” The group invested $20,000 to move the railroad line west inland to present day Seaview Avenue. The goal was to create a comfortable coastal locale apart from the more popular but more harried neighboring resort city of Long Branch. A train crosses Beach Road. During that age, mostly from 1880 to 1910, the New York Times society pages were stocked with notices on how the well-to-do families were “now in their summer cottage at Monmouth Beach,” with the mode of travel to their seashore respite almost always being by rail. 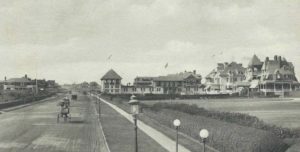 Once off the train they would be whisked away from the station in horse-drawn carriages to their stately homes, which ran along Ocean Avenue and circled the country club buildings on Beach Road. It was a postcard-like existence. The train had two stops in town — one just off Beach Road, mainly for passengers and post; one in Galilee, mainly for the fishing business. A third stop was at Low Moor, just over the Sea Bright border. From 1900 to 1940, even with Monmouth Beach in decline as a resort, the trains still ran — with three passenger stops and one freight stop per day. In November 1941, the NJ Board of Public Utility Commissioners gave permission for the Galilee train station to be closed. The small station had been built in 1903 at the height of the borough’s fishing trade. High living on Ocean Avenue. While there are stories of neighborhood houses coated with soot from the train’s coal-fired engines, only one serious “train” accident is know. A deadly and destructive mishap took place in Galilee when a southbound express train struck a loaded gasoline truck in the summer of 1917. The massive explosion took the lives of the locomotive engineer and the truck driver. The flames roasted three coaches of the train, the railroad station, and a surrounding field. The Beach Road location had two train stations. 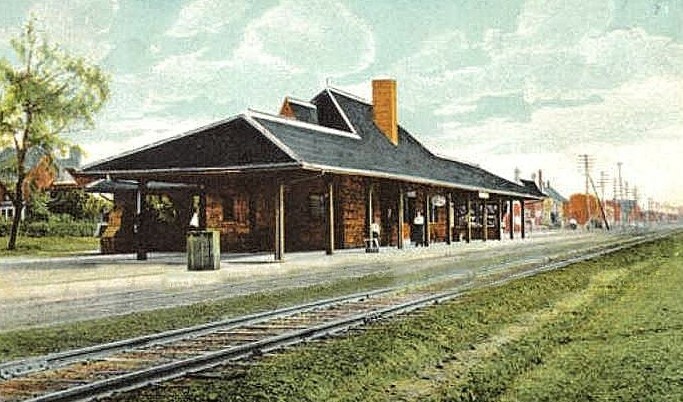 A second more elaborate station — its twin in Little Silver still stands — was built in the 1880s. The shore rail line was closed shortly after World War II and the large slate-roof station was torn down in 1955. By May 1953, Railroad Avenue had been changed to Seaview Avenue.